Or at leest, fur parti tu continyu! [wave] CB! Ohai! Ai havvn’t seen yoo inna wile. 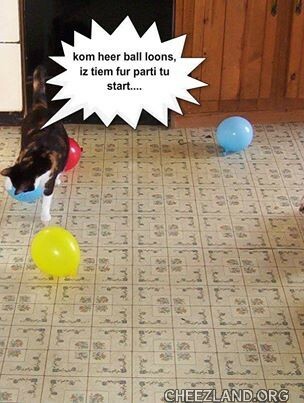 Come bakk for teh partee? Ohai, TJP!!! [ohai] Iz gudgud to see yoo agin. RL has been keepin me runrunrunning. Lukkily, tuday is kwieter tahn moast. Hao has yoo bin? [hug] nice tu see yoo Bin gud – Ai just got bakk frum visiting Momcat fore a cupplol uv days. Adn AI’m on vacashun for anuther week. Yay! Iz gud to see Momcat, yep yep. We had a vacayshun, tehn decided to has elebenty ob owr frends ober for a cookout on Caturday. Cleening, adn shawping, adn cooking, adn . . . Ai will be glad wehn itz ober. U nawt will be redeye until u kan whappity whap awl fore bloonz wif pointee endz wiffowt teh BOOM grassyhawpper. In Cheezland, the time is 05:22.